near North Berwick and East Lothian golf courses. Drem Farm House has an ancient history. It was built next to what was once a medieval Chapel of the Knights Templar (the remains of which are still in the garden), and in later Georgian times it was extended to become a substantial house. It is surrounded by gardens and trees and is the family home of Hugh and Marlene Smith who welcome guests to stay for bed and breakfast. (They also have a self-catering cottage for 4). Drem is a tiny village only 3 miles from the sea and 30 minutes east of Edinburgh. It has its own small railway station so you can go to and from Edinburgh without having to worry about city parking. All golfers will know about the golf courses of East Lothian... Gullane, Luffness, Muirfield, etc. 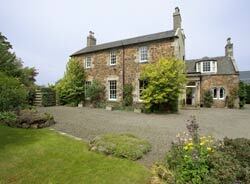 are all very close to Drem Farm House which would be a perfect base for them all. For dinner, there are some very good places to eat in the area around about, but Marlene also offers optional evening meals. If you would like dinner please give her advance notice. 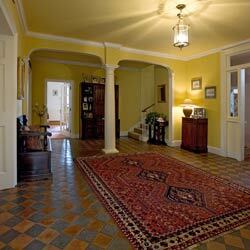 Entrance Hall with original salt-glaze tiled floor. Double bedroom with bathroom and shower en suite (illustrated left). 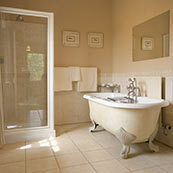 Double bedroom with its own private bathroom close by. 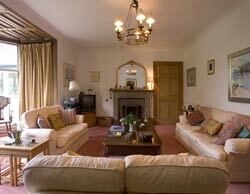 The Drawing Room downstairs is very comfortable and has a bay window looking onto the garden. Television. Wireless broadband available for guests' laptops. 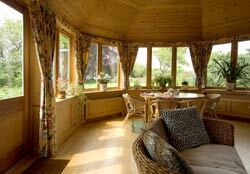 Breakfast (and optional dinner) is served in the Sun Room Conservatory which has a magnificent pine ceiling,and views onto the garden. Marlene makes a traditional cooked Scottish breakfast as well as fresh fruit, yoghurt, cereals and tea and coffee. For dinner, there are some very good restaurants locally. Also, with advance notice, evening meals are available at Drem. Marlene is an excellent cook. 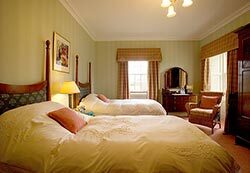 From £45 per person per night based on two people sharing a room, and including breakfast. 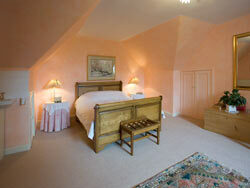 From £60 for single occupancy. 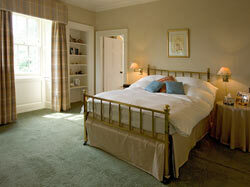 Family room available at standard rate plus £20 per extra bed. Dinner: £25 per person, ordered in advance. See also: self-catering accommodation at 'The Bothie': From £300-£550 according to season (please enquire to find out rate for any particular week), prices include linen, towels and all utilities. 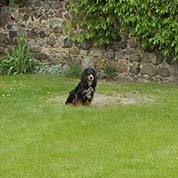 Baloo next to the ruined Chapel of the Knights Templar. 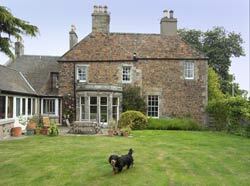 Please tell Marlene you found Drem Farm House through About Scotland!